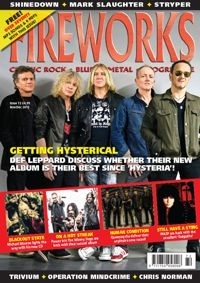 Fireworks #72 sees the mighty Def Leppard grace our cover, as they return with a brand new album... that might be their best thing since 'Hysteria'. A bold claim, but one that Phil Collen is only too happy to back up. And to prove there is two sides to every story, we also get the thoughts of Vivian Campbell, who sits down to tell us not only about the new album, but his health problems, his past work with Dio and Whitesnake and how he got the Leppard gig. It's one of the most honest and revealing pieces we're ever had, and is part of a truly awesome five page feature on the Sheffield legends. All that, plus Whitesnake guitarist Joel Hoekstra, Trivium, Mark Slaughter, Yes bassist Billy Sherwood, Status Quo's John 'Rhino' Edwards, Leaves' Eyes, Martin Barre, Shinedown, Chris Norman... we had so much to cover, we expanded the magazine to 100 pages. And then we added some bonus interviews to the FREE COVER CD. Don't be thinking there's just interviews on there though, those are included alongside the SEVENTY EIGHT FREE SONGS!